Children's stories, Nursery Rhymes, Spanish songs for kids, Grown-up's stories, poems, tips for Storytelling, bilingual tales, Educational research, ideas for Promote Reading and many other videos with subtitles both in Spanish and English. Beatriz Montero offers storytelling performances and workshops for babies, children and adults, specially designed for public libraries, cultural centers, schools, theaters, museums and universities. She is the coordinator in charge of the International Storytelling Network (RIC). 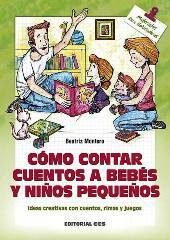 Cómo contar cuentos a bebés y niños pequeños te descubrirá las claves para disfrutar y enseñar a tu pequeño a través de cuentos, retahílas y canciones. Los primeros años de vida son muy importantes para el desarrollo de la persona, intelectual y afectivamente. "How To Tell Stories To Babies and Toddlers", CCS Publishing, Madrid, 2016, by Beatriz Montero, is her new book, now in bookshops and Online. Price VAT included: 16 €. How To Tell Stories To Babies and Toddlers, with creative ideas, stories, rhymes and games, will discover you the keys to enjoy and teach your child through stories, songs and jingles. The first years of life in children are very important for the development of the person, intellectually and emotionally. Los secretos del cuentacuentos descubre las claves para llegar a ser un encantador de historias, cuáles son los instrumentos del narrador, qué cuentos integran el repertorio adecuado, y cómo mejorar la técnica de contar cuentos. 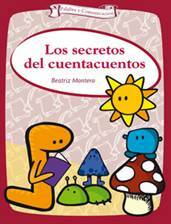 Es un libro imprescindible para narradores orales, educadores, bibliotecarios, padres y madres, y para todo aquel que quiera iniciarse y profundizar en el arte de contar cuentos a niños y adultos. Collection: 182 TALLERES No. 21. Price with VAT included: 13.50 €. The Secrets of Storytelling reveals the keys to become a magic storyteller, the tools of the teller, what stories make up the proper code and how to improve the technique of Storytelling. It is an essential book for storytellers, educators, librarians, parents, and anyone who wants to start and deepen the storytelling for children and adults.